Transport and Communications Minister Brian Mushimba says the aviation sector still remains open for the private sector to participate. Mr. Mushimba says consequently government has made the aviation sector not only conducive but also attractive for participation to the private players. Speaking in an interview with ZANIS in Lusaka today, the Minister commended Proflight and Mahogany Air services as well as other individuals and institutions who own airplanes for coming on board in the aviation industry. 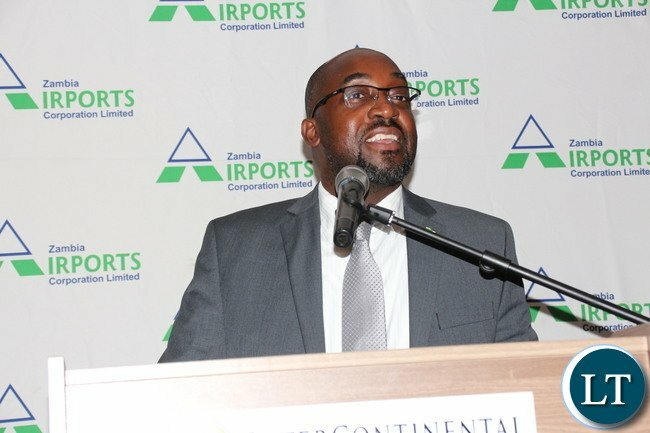 “Our policy as government is to make the aviation sector conducive to both old and new entrants to grow the industry,” he said.He dismissed assertions that aviation fees in Zambia are too expensive. The Transport Minister also stressed that government is confident that the soon to be launched Zambia Airways will succeed.Zambia Airways will fly efficient domestic and some regional routes. I don’t like this guy at all. His pictures reminds me of thug Kaizer. I can’t drink in same bar with these!!! He does not make policy. He just follows orders from his boss. Problem is that his boss is always drunk. As if it is saturated? Who in their right mind would like to invest in such a venture and compete with who? Zambian wayways? I wonder if these people do undertake feasibility studies to fathom the intricacies and viability of such ventures. At national level, the incompetence propagated by these misfits is appalling. Soon they will come back and ask the Chinese to partner with them as the loan would have been gobbled by then. These PPPs are terms that have been abused with impunity to camouflage corruption and grand larceny. The chap Brian must think investors are as dull as his cadres surely how can it be conducive when the govt plans to create an airline to compete with the private sector on popular regional routes. Iwe Brian, who is going to invest in an Airline operating Russian planes as rumour has it??? Apapene guys you must be serious. Let’s develop this thing! It will NEVER be president! ECL should seriously consider making this guy his successor. He is educated having graduated from the University of Arizona and in case you didn’t know he runs the Mushimba academy which today has sponsored 130 students from poor backgrounds at a personal cost to him of $25,000. Tell me how many ministers will use their personal money for such a wonderful cause. Do you know what an educated foooool is? open your eyes as you land, you will see educated men and women in Zambia, they offer charity to their communities in various ways. charitable ventures can be the means of dodging taxes. so characterize properly the sources of funds for the said academy. nevertheless, good for beneficiaries of the funds. What did he staudy at uNIV OF ARIZONA? Though not important the man tries to EXPLAIN GOVERNMENT POSITION ANYWAY AND HE IS KNOWLEDGABLE, THE PROBLEM IS HIS PS SHOULD BE HIS MENTOR ON POLICY UNFORTUNATLEY ITS ONE BLIND MAN LEADING THE OTHER. BETTER HAVE TWO PS ONE FOR COMMUNICATION AND THE OTHER FOR TRANSPORT. But what happened to no matter what zambia airways will launch on 24th October without fail and now to it will launch soon. How do we believe anything that comes out of this Arizona mouth. If you all have nothing better to say, you should all be keeping quiet. It’s embarrassing how pessimistic you all are. This is our country and yet all you do is just make noise. What is it that you look for. Can’t you see what good is happening for the country.